That looks absolutely divien! HEAVEN!! Your layer cakes are a force to be reckoned with! 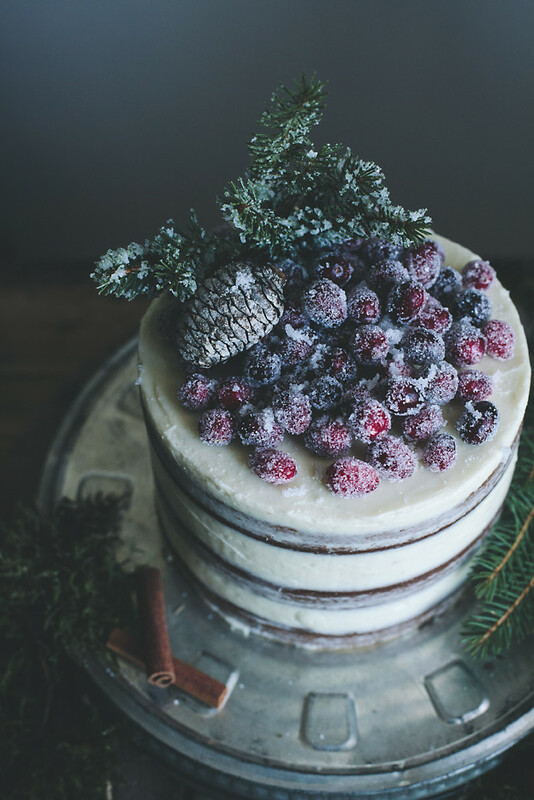 I love those sugared cranberries on this cake. So gorgeous! Wow, this whole setting is ridiculously beautiful. 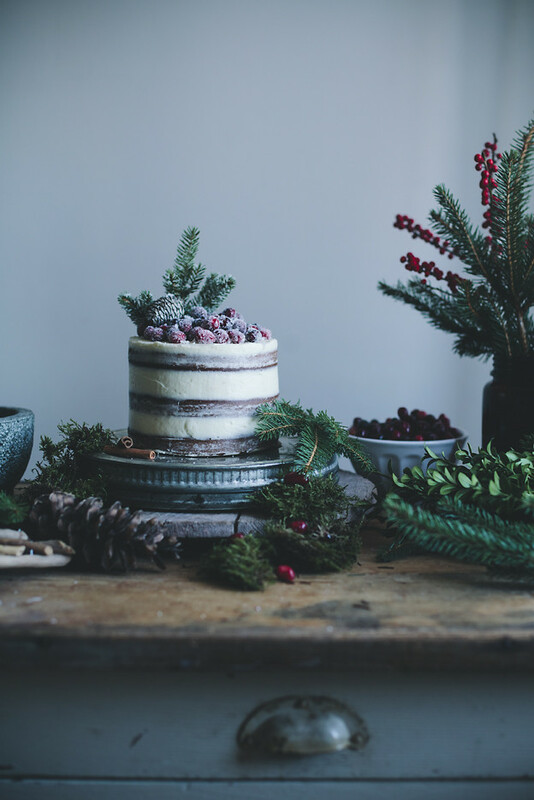 I just adore your decorating skills and capturing everything so perfectly in your photos! This is truly amazing, I love the decorations and the cake platter you used!! What a beautiful cake. I will be making this for the holidays. I love your old film reel tins. My grandparents owned a theatre and I was lucky enough to get a few of those tins. I dip chocolates and the tins are perfect for storing them. You do beautiful work. Photo's, recipes. Fabulous. 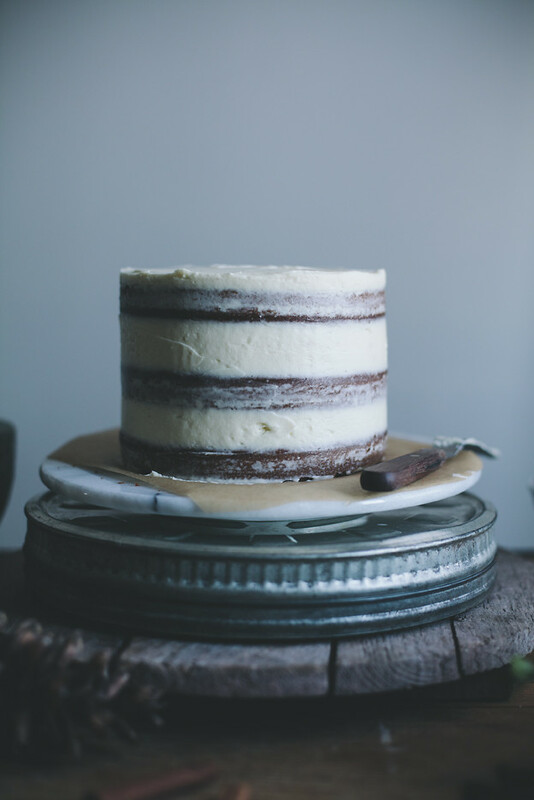 I'm so in love with this effect of frosting the cake so that the layers are still visible! 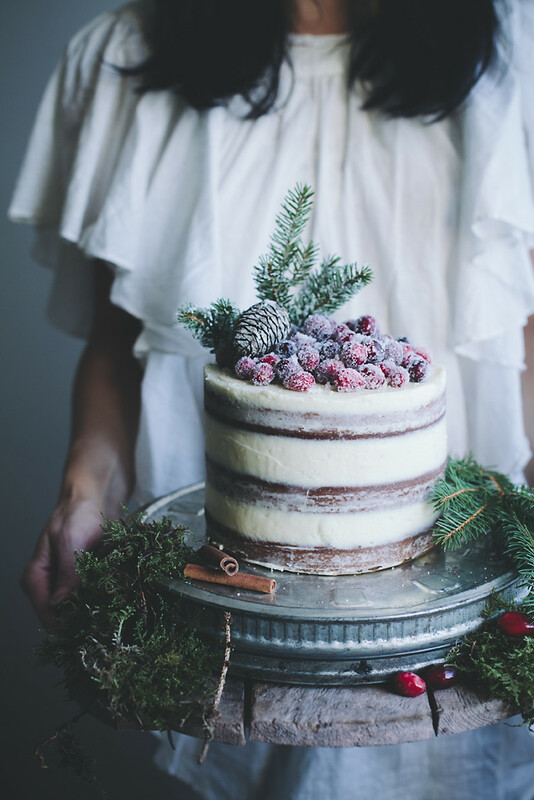 I've just recently seen another gorgeous cake frosted this way, too — between yours and theirs I'm pretty sure I'll never feel the same way about fully frosted cakes again! Just lovely. Hi, Lisa. This cake is so beautiful. The hardest part is to assemble the cake like you did… Why don't you post a video teaching how to assemble it correctly. It would be very helpful. Absolutely stunning. Your blog is a huge inspiration for me. Thank you! Oh wow this is awesome! I love it so much! Happy December! Love to you! So incredibly beautiful – just magic!! This is true art! LOVE the cake and all the photos, beautiful, beautiful! You had me at 'soft gingerbread cake'. 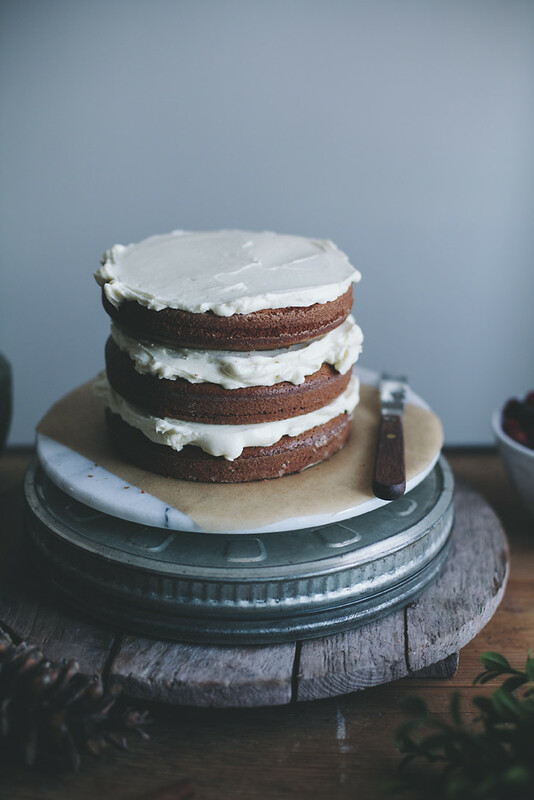 But it looks so incredibly beautiful – I love the cake naked with just a crumb coat. And those sugared cranberries look magical. Truly. Ljuvligt Linda – helt fantastiska bilder! Finns recepten på svenska någonstans nuförtiden? I would probably not use raspberries for this as I think they are too soft.. blueberries, lingonberries or currants would be better! Just stumple upon your blog. Wow! It's lovely. 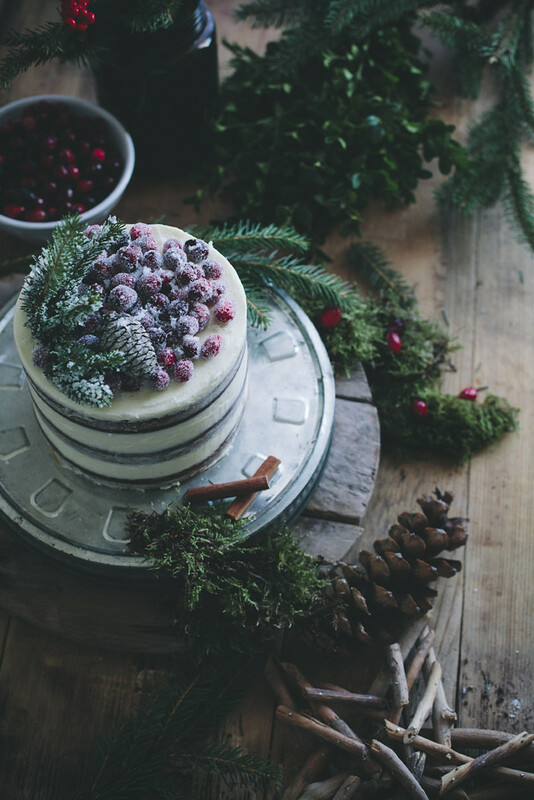 Any chance you can give tips on how to make that smooth, thin layer of icing around the cake so perfectly? I have just recently discovered your blog and it has been such an inspiration, I honestly want to try just about every recipe I come across. these photos of sweets makes me hungry! Baked this cake for a Christmas party, it turned out so well! Tastes fantastic and looks really great with sugar cranberries. I used Bakers Royale recipe for cranberries and it worked well and there is no eggy smell. Thanks for a great Blog! Soo happy to hear you enjoyed this cake! Thank you for the kind words! Simply lovely! Curious…how many people would this serve? Could I use honey instead cane syrup? Made this yesterday for a birthday. Couldn't get it the gingerbread to rise enough, but very good! 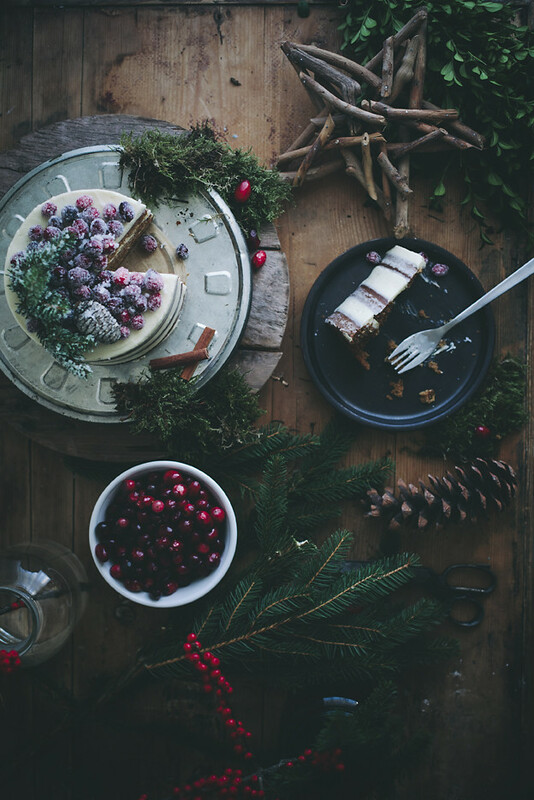 I am planning to prepare gingerbread cake with cream cheese soon as it sounds lipsmacking and healthy. thanks for the replay , another question , do u mean purpel or royal blue or both togather ?? and can use this icing to ice carrot cupcakes is it easy to pip ?? Hey, just wanted you to know I was so excited to make this cake for our Christmas party tomorrow. I even bought three new cake pans that were the right size. I've now made this through twice.. being meticulous about weighing/measuring ingredients and both times the cakes did not have enough batter to even cover the bottom of the pans and they did not rise more than 1/2 inch both times. I can't imagine what I've done wrong?? Hi there! I'm so sorry to hear that! The only step I can imagine where things could go wrong is the whipping of eggs and sugar, where the batter should be very fluffy. Are you ok with the ml measurements? Maybe I should go ahead and change them.. I've made this cake several times and it really should rise a bit, and it should be delicious of course! Beautiful, just beautiful. I am mesmerized (and perplexed) as to how you were able to make the frosting lines so perfect. I see that the frosting covers the cake so that the width of the frosting is wider than you'd think if you just do a thin layer of frosting all over. Is there a secret for the we newbie bakers to get it to look so even and great? I would love to make this for our Christmas. Thanks!! Just love this site. Hi did you use salted or unsalted butter for the frosting? I always use salted because I prefer it, but you can use either! I've made this every year for Christmas for the past 3 years. It is always fantastic, and a show stopper. I made this last year for our family Christmas dinner. It was a HUGE hit and everyone is already asking for it again this year! Thanks so much, this recipe is already becoming a family tradition for us. Hello! 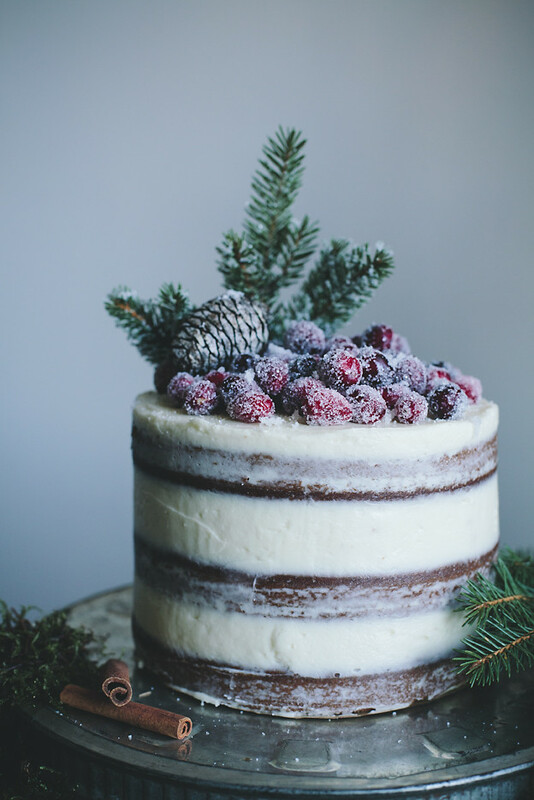 I am excited to make this for Christmas, but I’m worried it won’t fit in a standard cake carrier since it’s 3 layers. Do you believe it will fit? The tallest carrier I can find is 7-8 inches. Thanks! I’m not sure it would fit actually. Those carriers are usually a little rounded, aren’t they? If possible – bake the layers in larger pans (like 8 inch/20 cm) – you could even make just two layers in larger pans. Just make sure to adjust the time accordingly and start checking doneness a little earlier. That would make a wider, but not as tall cake and should fit in a carrier. Hope that helps! Ok perfect! That’s what my backup plan was but I wasn’t completely sure if I would need to change the amount of ingredients/time. I’m a baking newbie 🙂 appreciate the help! I just discovered your blog via a link on Pinterest and your cake looks amazing, elegant and stunning. After Christmas I will return and spend some time looking around. I have a question about how you decorated the cake. I’ve done the cranberries before with great success. 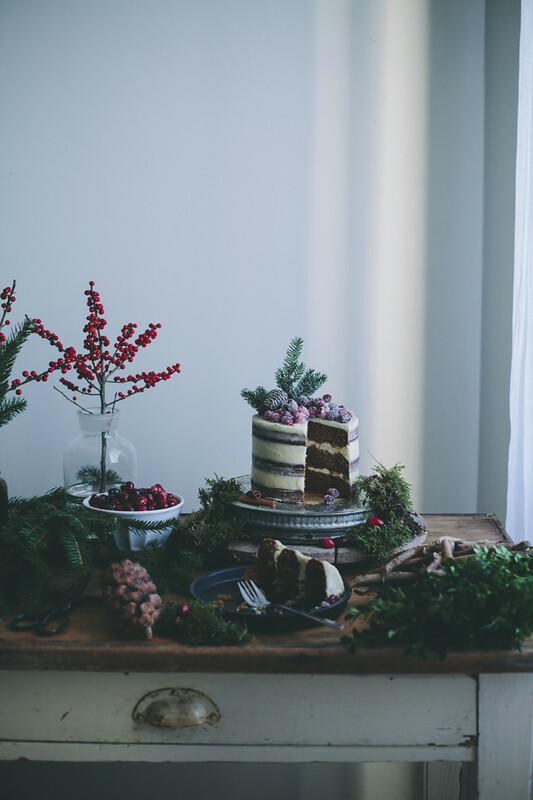 But I am wondering about the other decorates…the sprig of greens and the pine cone. As they are not safe to eat how did you go about using those on the cake? It really does make the look dramatic and I would love to use those. Any suggestions? My only thought was to put a sheet of parchment paper over the frosting then lay that down and cover it with a thin layer of the frosting to cover the paper. Hi Sandra! Thanks so much for your sweet comment! If you pick these outside you can just rinse them under water and then let them dry and use them safely on the cake. Neither pine cones nore pine sprigs are toxic and are thus completely safe to decorate with! Of course, they wouldn’t be delicious to eat.. Hope that helps! Thank You for replying so quickly. I was just wanted to be sure before placing them on the cake then having a group of people sitting there hashing over the pro’s and con’s of whether they were going to end up in the ER. Will venture out in the yard on Christmas Eve and gather a few as I know the lawn and garden in my complex are never sprayed. 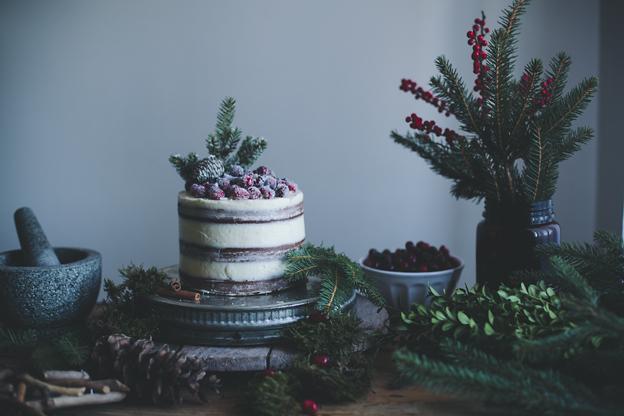 I made your cake last Christmas and am about to make it again as it was so delicious. Better than Christmas cake. I’ve had this post pinned for a few years and never gotten around to making it. This year is the year! But I have a question about the cane syrup. From what I’ve gathered online, both Steen’s and Lyle’s make a cane syrup but they are very different in flavor. Did you use one of these brands? I’ve never used cane syrup before. Thanks! This cake looks amazing and I really want to get BR it a go! I have been asked by my mother in law to make the Christmas cake this year for 14 of us. I am not a great baker! My question is… how easy is it to make this well? Also, can I make the cake a few ahead of time and freeze it, and then ice it on Christmas Eve? I’ve made this cake twice following the measurements exactly. While it tastes good, I definitely don’t get the rise for 3 cakes – barely enough for 1. I’ve had to double the recipe each time to get 2 cakes. Not sure what I may doing wrong to get such a low rise. Hi Farah! Looking at the photos her cake looks wider to me, she may be using larger baking pans – 8 or 9 inch, but I can’t be sure as it doesn’t say in the recipe (as far as I can see). Hi Linda – you are right! I wasn’t using 6 inch pans – that was the mistake. I guess I wasn’t following your recipe as exactly as I thought! Thanks for getting back to me. The cake did turn out beautifully though! Hi Farah! Ah, I’m glad we were able to figure it out 🙂 Glad to hear the cake turned out anyway! I’ve just made this but I had some problems 😬 the butter and sugar mixture never got fluffy, it only got thicker and a hot lighter in color. And the batter was quite lumpy at the end, but I also didn’t want to overmix the batter. I’ve never had a problem with your recipes before. Any idea what I did wrong?? Hi Julianna!The eggs and sugar mixture should easily get fluffy and light in color within minutes! But you say it’s thick and light, sounds about right to me?! 🙂 Perhaps your eggs were too cold? They get less volume when whipped if they are very cold. You can give it a quick whisk at the end if you feel that the batter is quite lumpy, I tend to do that, just to get rid of any flour clumps. Or simply sift in the mixture! Hope that helps and sorry to hear you’re having problems! Sorry, I meant eggs and sugar, not butter and sugar.